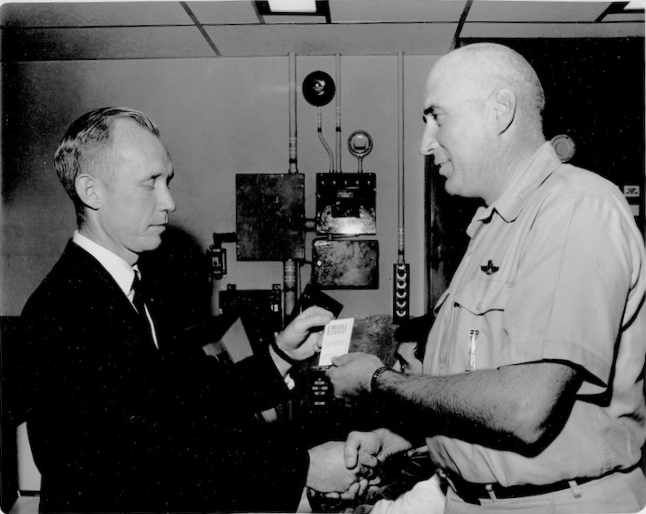 Lieutenant Colonel Swazey, Site Commander 566th of Francis E. Warren Air Force Base, presenting Dr. Cal Fowler (1929-2013) a Missile Expert card. Dr. Fowler, who later launched Mercury astronauts Scott Carpenter (1925-2013), Wally Schirra (1923-2007), and Gordon Cooper (1927-2004) into orbit, was working at Warren AFB testing and installing Atlas Intercontinental Ballistic Missiles (ICBM). Holland, Stephen L. From Mules to Missiles: A History of Francis E. Warren Air Force Base and Its Predecessors, Fort David A. Russell and Fort Francis E. Warren. Warren AFB, Wyo: [Dept. of the Air Force], 1987. “Dr. 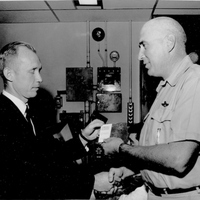 Cal Fowler and Lieutenant Colonel Swazey.” RICHES of Central Florida accessed April 23, 2019, https://richesmi.cah.ucf.edu/omeka/items/show/6392.